This article is part 8 in a series of articles on deploying RDS in Azure IaaS using ARM & JSON Templates. Here is a quick overview of previous articles on this topic. In this part of the series, we’ll add both Microsoft Antimalware for Azure Virtual Machines (Defender) and BGInfo to the deployment. If you’re not familiar with one of these tools, here is a brief introduction. What is Microsoft Antimalware for Azure Virtual Machines? Microsoft Antimalware for Azure Virtual Machines is a real-time protection capability that helps identify and remove viruses, spyware, and other malicious software, with configurable alerts when known malicious or unwanted software attempts to install itself or run on your system. BGinfo is a small but very powerful Sysinternals tool that automatically displays relevant information about a Windows computer on the desktop’s background, such as the computer name, IP address, service pack version, and more. Using ARM to deploy Microsoft Antimalware for Azure Virtual Machines (Defender)Let’s start with adding Microsoft Antimalware for Azure Virtual Machines, which we’ll refer to as Defender in this blog post. When running a Virtual Machine in Azure IaaS, Defender can be installed as an extension on top of a Virtual Machine, including specific exclusions you might want to have. To easily add Defender to Virtual Machines that we’re running for our RDS deployment we’re using the extension called IaaSAntimalware. The JSON code to add the Defender extension to our VM’s looks like below. Basically we create a new VirtualMachine Extension and set ‘IaaSAntimalware’ as the type. Using the settings section, we can then further define the custom settings. In this case we define whether or not real time protection is enabled, and what type of periodic scan is performed. Furthermore, we define the file type extensions, paths and processes we want Defender to exclude. To be able to define different exclusions for the different RDS roles, we define separate exclusion parameters for each role type. To accomplish this, we introduce the following parameters for each role type. And the following parameters are shared across all role types to define the scan schedules. When running the ARM template, we can define all of the parameters to customize the usage of Defender to our needs. By default, the periodic scan is scheduled weekly at midnight performing a quick scan but this can obviously be modified at will. As you can see we can also enable or disable real time protection per role. And we can configure a semicolon separate list of exclusions to exclude paths, processes en file extentions. The exclusions are important to configure to not run into any unnecessary performance issues after deploying Defender. For example, for the RD Gateway role I added the following exclusions, a mix of common exclusions like the logs & databases of the SoftwareDistribution folder, eventlogs and IIS log files. %windir%\SoftwareDistribution\Datastore\Datastore.edb%windir%\SoftwareDistribution\Datastore\Logs\Res*.log%windir%\SoftwareDistribution\Datastore\Logs\Edb*.jrs%windir%\SoftwareDistribution\Datastore\Logs\Edb.chk%windir%\SoftwareDistribution\Datastore\Logs\Tmp.edb%windir%\Security\Database\*.edb%windir%\Security\Database\*.sdb%windir%\Security\Database\*.log%windir%\Security\Database\*.chk%windir%\Security\Database\*.jrs%allusersprofile%\NTUser.pol%Systemroot%\System32\GroupPolicy\Registry.polC:\inetpub\logs\LogFiles\W3SVC1\*.log%SystemRoot%\System32\Winevt\Logs\*.evtx%SystemRoot%\SYSTEM32\Logfiles\*.logFor the RD Session Host role, it’s also important to take a close look at exclusion, especially because these are the servers that will host active user sessions. Common exclusions for the RD Session Host role are e.g. the Printer Spooler, the winlogon process, etc. 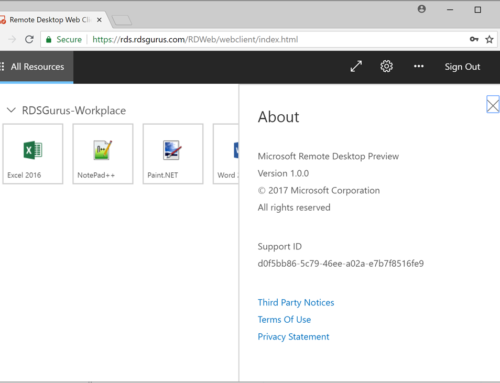 After completion, the Azure Portal shows a defender extension object per virtual machine. And when logging on to one of the created Virtual Machines, in this example one of the RD Gateway Servers, we can see that Defender is running with real time protection enabled. And we can confirm that the exclusions we defined in our JSON parameters files are correctly configured as well. Using ARM to deploy Sysinternals BGInfoLet’s now look at the second addition in this blog post, BGInfo. If you’re managing multiple different servers for your organization or maybe even for multiple organizations, I’m sure you’re familiar with BGInfo. BGInfo allows you to display details like IP addresses, hostname, bootime etc. about the Virtual Machine you’re currently connected to. It’s a great tool that has been out there for many years. Of course you can manually download and install the BGInfo tool on all your servers, but since we’re doing an entire deployment based on Azure Resource Manager, let’s use ARM for this deployment as well. Installing BGInfo from ARM is actually much easier than you might expect. There is a BGInfo Extension that you can directly reference from ARM. You create a new resource of type extentions and provide ‘BGInfo’ in the type in the properties. We do this for each of the loops of Virtual Machines we’re creating (hence the copyindex function in the name) and that’s basically it. Alter completion the Azure Portal shows the various BGInfo resources. And when logging in on one of the servers we can see the result, BGInfo is there! ARM Extensions like Defender and BgInfo add even more power to Virtual Machines running in Azure IaaS. These are just 2 examples of extensions that I thought would make sense to add to existing RDS deployment, but there are many more out there. This concludes part 8 in a series of articles on deploying RDS in Azure IaaS using ARM & JSON Templates.